Ok – so it’s been months since I’ve posted. Here we go. Nineteen sixty-one saw the release and nomination of two post-World War II epic dramas. One, Judgement at Nuremberg, focused on a singular moral dilemma during the Nazi trials held at Nuremberg after the Paris Peace Conferences. This film capitalized on a particular formula – the courtroom drama – to display deep character analysis while holding other aspects like plot, setting and time static. It’s a clever and logical ordeal: Judgement at Nuremberg did not invent this process, nor did it define it. Movies like All The President’s Men and My Cousin Vinny have taken a modern approach to the concept – with wildly different motives and results, but the premise remains the same. The other, The Guns of Navarone, instead morphs the epic war film into a rag-tag collective film. Think Ocean’s Eleven x Zero Dark Thirty….on quaaludes. It’s an interesting mash-up of two storytelling modes and this merger is necessarily clunky: the backdrop is World War II, but the Nazi officers’ attitudes seem relatively nonchalant and the conflict seems rather subdued. Set in the Aegean Sea, this conflict has seemingly nothing to do with the Nazi agenda insofar as the plot needed a malleable enemy. 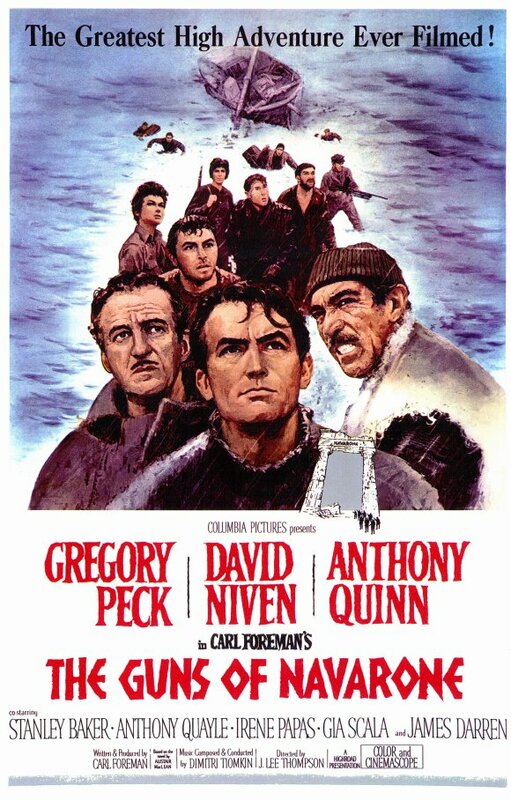 This movie is really about the connections between the cast – an emblazoned Gregory Peck as Captain Keith Mallory, an expert mountaineer, a moody and gloomy Anthony Quinn as Andrea Stavarou and smart-mouthed David Niven as Corporal Miller. Among this cast is a further rag-tag group of “doomed” men (and later…women! ), sent to the island of Keros to disable radar-enabled anti-ship guns so that the Allied forces can sneak in and rescue a few thousand stranded men. That’s the plot for two-and-a-half hours. Now, think about the simplicity of this concept: Nazis with no agenda, a black-and-white conflict with minor and almost inconsequential consequences, a cast of characters whose skills are almost irrelevant and a hackneyed moral climate….so the character palate better match that of Judgement at Nuremberg. I won’t ruin a major – the only – real conflict in this film, but I will say that since the audience knows in advance that the overall conflict will be successful, shouldn’t it have hurt to include actual, subtle drama amongst the cast besides some hurt feelings. On a scale of zero to Gladiator, The Guns of Navarone is a Sesame Street. The silver lining is, of course, Gregory Peck’s acting. He would go onto win a Best Actor nod the next year for his most memorable role as Atticus Finch in To Kill A Mockingbird. But it’s his acting in The Guns of Navarone that kept this film afloat. He’d been a major Hollywood actor for at least 17 years prior and had been nominated 4 times before his lone win in 1962. He’d earned his chops among the first golden age of film in the 1940s and his radiance helped keep relatively flat performances of highly decorated actors somewhat charged (Niven won a Best Supporting Actor in 1958s Separate Tables and Anthony Quinn had already won Best Actor twice in 1952 and 1956, most notably for Lust for Life). What happened? A big-budget war film, mixed with a wanton nationalism, tossed with fantastic actors and served with a side of “too many cooks” spoiled this film from being….an adequate representation of Alastair MacLean’s book of the same name and a few years prior. Like so many films today, this one should have stayed in book form. From the accounts, too, this picture seemed doomed from the start – creative differences among the production staff and the film crew almost took this picture out, if it weren’t for its place in a cycle of heavily financed war films. Adapted screenplays weren’t a novel idea in the 1960s and they’re not getting newer in the 2010s, but the key, as it were, is to have a supremely keen eye for which films should be adapted to the screen. For example, 2013’s brand new winner for Best Picture, 12 Years A Slave, is a careful rework of an autobiographical tale that benefits from character depth to help tell the main character’s story. Most fantasy and dystopian re-imaginings are just that – a transfer of a story to a different, new and visual medium. They should not be treated as a carbon copy, nor should a viewer expect a screenwriter and director to reenact each and every plot line to a T. The Guns of Navarone should have stayed as a book because the characters were boring enough to fall asleep reading to. During a strange time in viewer tastes, 1961 awarded its highest motion picture honor to West Side Story, which, 50+ years later is a classic, simple and exciting film filled with clear conflict, motivated characters and….song. In reality, Judgement at Nuremberg and The Guns of Navarone most likely canceled each other out. It’s fine to leave this one on the shelf.